The American Alligator is a giant primordial predator living in close proximity to us here in New Orleans. You may not know it, but this reptile of repute is a looming figure in the history, folklore, and economy of Louisiana. Not only does it grace the seal of the city of New Orleans, but the American Alligator is the official state reptile. It was both friend and foe to early settlers and Native Americans, and has bounced back from the brink of extinction to be one of the greatest success stories in wildlife protection. The museum building was purchased by Robert and Elizabeth McDade in 2005 with the intention of opening an alligator museum – the first in the country. With degrees in geology, engineering, and biology, the study of science – especially the natural sciences – has been an abiding passion. This passion was magnified when during his time roughnecking in the Gulf of Mexico and Louisiana swamps, Robert was struck with a severe case of “gator-itus”, a fascination with everything related to Alligators. 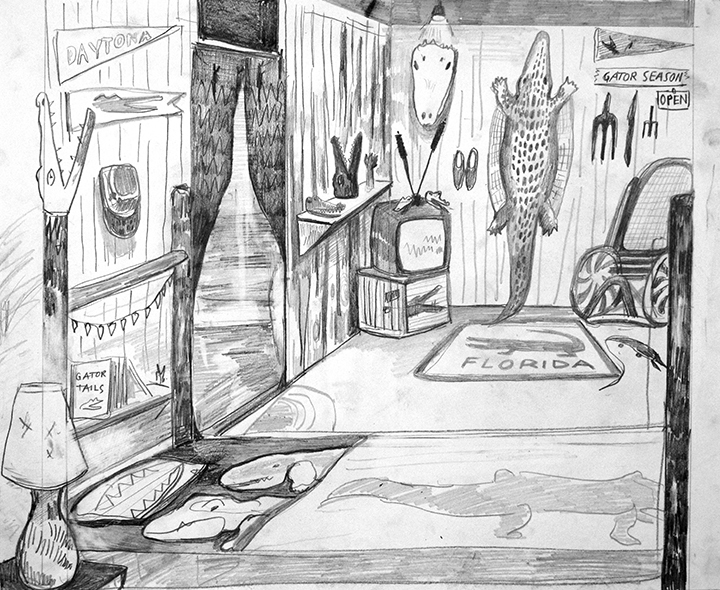 He started collecting alligator-related artifacts and soon developed a product line under the brand Alligator King, in time becoming the premier distributor of alligator-themed souvenirs. Meanwhile, Robert continued to collect everything he could find relating to alligators. He found a 50-million-year-old alligator fossil from the Green River formation in Wyoming, a 10-million-year-old fossil from Florida, giant scutes from 12-million-year-old gators from Florida, deformed alligator heads, over a century’s worth of antique alligator-related postcards, video games featuring alligators, vintage alligator fashion items, movie posters from around the world, folk art, toys, household goods, and by far the largest collection of alligator ashtrays and salt and pepper shakers in the USA, not to mention the museum's centerpiece, an formidable 14-ft gator named Fideaux. As the artifacts accumulated Robert decided that he wanted to share his unique and extensive collection with the public. 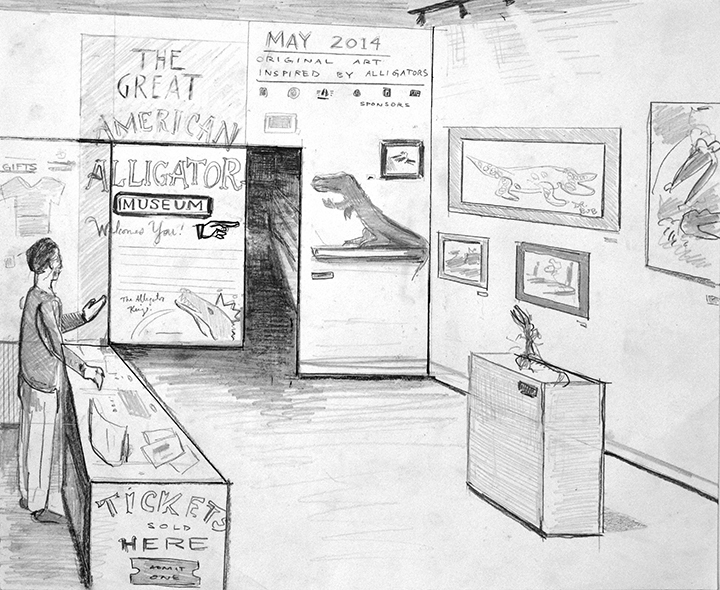 The idea for The Great American Alligator Museum was born and preparations to open were fully underway by August 2005 when the city of New Orleans was inundated by Hurricane Katrina. The project was indefinitely derailed until now. As New Orleans continues its path toward recovery, NOW is the perfect time to open the Great American Alligator Museum to the public. If ever there was an animal deserving of a museum dedicated to its story, it is the American Alligator. Located in a 160 year old commercial building in the Lower Garden District section of Magazine Street, the Great American Alligator Museum will add to Louisiana's alligator experience by presenting all aspects of the American Alligator with fun and engaging exhibits complete with a tank of live baby alligators. Utilizing the collection we already have, the museum will take visitors on a narrative journey beginning with the Late Cretaceous origins of the alligator, when it roamed planet earth along with dinosaurs and flying reptiles. Fossils will give way to taxidermy specimens and live baby alligators in order to educate museum goers on the anatomy, habitat, behavior, and other biological characteristics of the American alligator. As visitors continue through the museum other sections will address the alligator's role in mythology, folklore, fashion, art, entertainment and commerce. Additional space will be provided for a museum shop and gallery featuring temporary exhibitions by local and regional artists. We think this museum will be an impressive addition to the cultural fabric of New Orleans. As much a community resource as a tourist destination, the museum will be home to a variety of programs and opportunities including school group visits, birthday parties, talks, screenings, demonstrations, cocktail parties and art exhibitions.